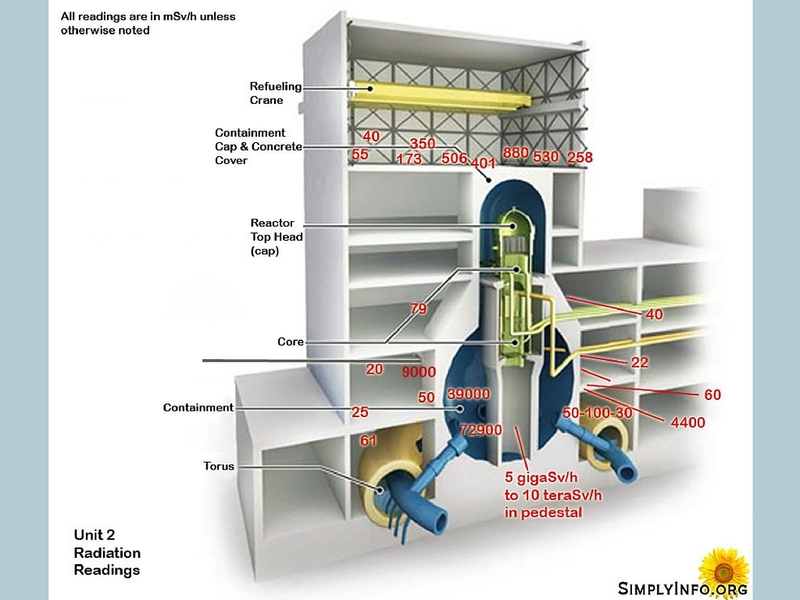 Historical information and statistics about Fukushima Daiichi Reactor 2. Scroll down for more date specific events at Unit 2. We are in the process of adding to this. Historical graphs of reactor data, click here. The second of the Fukushima Daiichi reactors to be built, unit two lost emergency cooling function of the ECCS at 4:36pm on March 11 after the earthquake. 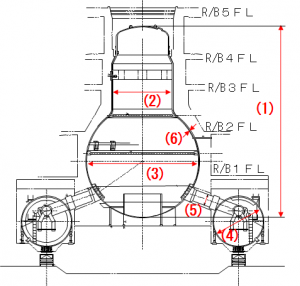 The pressure control function was lost at 5:32am JST on March 12th. 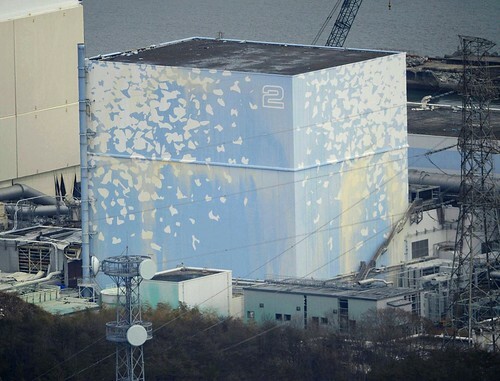 The reactor water level was found to be low at 1:24pm JST leading to the conclusion that reactor cooling function had been lost. On the morning of March 13 an attempt was made to manually open the venting valve. At Midnight March 14th, another attempt to open the venting valve was tried. Sea water was injected into unit 2 in an attempt to establish cooling functions at 4:34pm JST on March 14th. It suffered a hydrogen explosion at 6:20am JST March 15th. The hydrogen explosion blew holes in the suppression chamber. (**this initial reporting and assumption from TEPCO has now proven to be untrue, inspections of the suppression chamber found no damage). After this incident radiation levels at the main gate spiked to doses reaching 11,930 microsieverts per hour from 73 microsieverts 3 hours earlier. The damage led to leakage of the contaminated water into the rest of the building, then into the ocean. What may be the likely failure point is the containment cap gaskets. Radiation levels are quite high on the refueling floor near the reactor well and a visible steam leak under pressure was cited in the edge of the reactor well near the blow out panel. It is now estimated that the reactor core melted to the bottom of the reactor vessel within 16 hours of the station black out (power loss). The melted core is also likely melted through the vessel and is somewhere within the containment structure. It is also likely that the lower suppression chamber is damaged and causing radioactive water to leak out of the containment. This initial assumption about the suppression chamber is being rethought after multiple inspections of the suppression chamber showed no visible damage. Radiation levels in the suppression chamber are also fairly low. 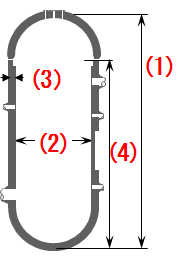 An inspection of the MSIV room (main steam isolation valve), represented on building diagrams as the area of pipes that go towards the turbine building found low levels of radiation and no visible damage. These newer findings challenge the earlier idea that unit 2 had a massive lower fuel leak that caused the high radiation found in the unit 2 intake canal near the port. *please excuse our mess as we update the reactor pages. We are adding in factual data of the ongoing events to build a larger record of each unit. July 2012 TEPCO states spent fuel pool has been desalinated and releases this document with a timeline of activity & testing of the SFP water chemistry. It shows the elevated chlorine levels in ppm, and is proof of the fact that the levels were extremely higher than normal which can accelerate chloride stress corrosion on all the piping and fuel. The normal chloride concentration about 100 ppm per TSR they were at 1500 ppm. These are critical units for chemistry is chlorides, Ph, conductivity and filterable solids. As we all knew they are completely out of control from a chemistry standpoint, also they look at the boron concentration and they pumped that level up long ago.